We all know that Sony’s latest PlayStation 4 console is strictly not backwards-compatible, but that doesn’t mean users are not able to enjoy PlayStation 3 games on the latest console. Now everyone can have access to tons of last-gen games on the PlayStation 4 console as Sony’s most praised Gaikai-based video game streaming service, PlayStation Now, has now entered into its open beta phase on the PlayStation 4, offering instant access to a total of 123 PlayStation 3 games. Check out the names of all these included games in the list provided below and follow the walkthrough video to access PlayStation Now instantly. The Wait is finally over, as of July 31st, the open beta for Sony’s PlayStation Now, the most anticipated Gaikai-based video game streaming service which provides access to PlayStation content on PlayStation consoles and Sony TVs, has gone live for all the PlayStation 4 users based in the US and Canada only, though the service will soon be made available in other regions too. The announcement was made on the official PlayStation Blog. PlayStation Now has been in closed beta since January 2014, but now it has entered the open beta, allowing all users of the latest console to access games that were released on Sony’s last-gen console. According to the Japanese platform holder, the service will be exclusive to the PlayStation 4 console for now, but it will soon be coming to other PlayStation platforms as well such as PlayStation 3, PlayStation Vita and PlayStation TV. To guide you and help you get up to speed on everything, Sony has officially released a PlayStation Now walkthrough video, featuring commentary from Jack Buser, who is the senior director for this service. The concept of PlayStation Now is pretty simple, you can rent PlayStation 3 games for time periods ranging from 4 hours to 90 days, and stream them directly to your PlayStation 4 console for now, but after the full release, the streaming will be available on other PlayStation devices and selected Sony TVs as well. You can check out the PlayStation Now walkthrough video below. 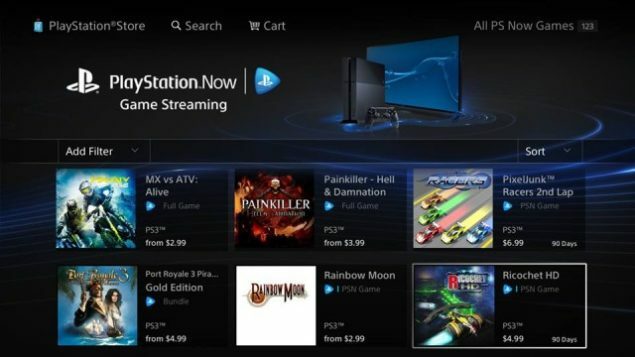 PlayStation Now Open Beta has been integrated into the latest consoles’ PlayStation Store, users can head over there right now and choose to stream between a total of 123 PlayStation 3 games for 4-hour ($2.99), 7-day ($5.99), 30-day ($7.99) and 90-day ($14.99) loan periods. Sony has stated that these prices can be subjected to change and that a $1.99 tier will be added in the future. The firm is also considering a subscription plan right now, but there is currently no ETA on that. Now that the PlayStation Now is ready for grabs, many of you might be wondering what are the names of those games that have been added by Sony to the service on day one. Well you don’t need to wonder anymore as we have a list containing names of the PlayStation 3 titles that are can be streamed right now. Thanks to NeoGAF user, you can check out the list below to see what is waiting for you at PlayStation Now on PlayStation 4.